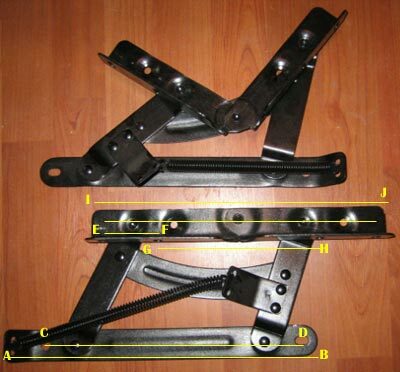 Standard Metal Futon Hinges- This item is a Pair of Quality Metal Futon Hinges. These hinges have 2 positions, Couch, and Bed. They are also known as Futon Transmissions and are used on Metal Futon Frames or Futon Frames with Wooden Arms and a Metal Seat and Back Deck. If our hinges don't work for you, you may send them back, undamaged and resalable, and we'll issue a refund less our original shipping costs. A to B = length of the bottom of one hinge is 13.5 "
C to D = length from the center of each hole that attaches the hinge to the arms of the frame is 11.5"
E to F = distance between the 2 holes in the top of the hinge which attach to the Seat or Back is 2 3/8"
G to H - Distance between each set of 2 holes which attach the Seat or Back is 7"
I to J = Overall length of the top surface which the seat and back attach to is 12 5/8"
Note: Sizes above are approximate. Orders normally arrive within 2 weeks and can be shipped by FedEx, UPS, or USPS.